Picture this: You and a friend/significant other glam up for your personal photo shoot. However this is not like any other photo shoot you are likely to have again. 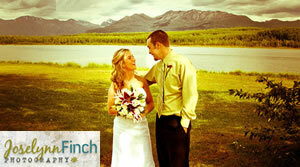 You meet your photographer, Joselynn Finch, owner of Joselynn Finch Photography. Then you jump aboard your personal air transportation to your remote portrait session locationÂ via Alaska bush plane. The flight to and from the session will include amazing views of Mountains, lakes, and glaciers. The location will depend on weather and conditions, but Alaska has thousands of scenic remote destinations to offer as a backdrop. After Joselynn has setup her gear, prepare to be treated like a model. Joselynn has been taking pictures since she could hold a camera and her photos go beyond the smile and show the personality of the individual. With todayâ€™s Alaska Rewards offer you get a remote photo shoot with the talented Joselynn Finch which includes air transportation to a remote location. After the shoot has been processed you will be able to view your private online gallery of several dozen images from the two hour portrait session. Once you select your 20 favorite images a CD will be sent out to you with full copyright benefits. If you simply canâ€™t select just 20 you can always upgrade the package for a nominal fee. This package normally retails for $2,350 for two people, but with todayâ€™s Alaska Rewards offer you can have this for only $940, thatâ€™s a 60% discount! If you just got engaged or have a family member that just got engaged this is the gift for them. If senior portraits are needed coming up stand out from the rest with a photo shoot that is one of a kind. If you have an anniversary coming up this is a great opportunity to update your photo album. Give them the gift that lasts a lifetime and is passed on generation to generation. Snap up this deal for a photo shoot that stands out from all the rest from Joselynn Finch Photography and Alaska Rewards. Limit 3 per person, may buy 2 additional as a gifts. By appt only. 72hr cancellation notice required. Not valid with other offers. If photo shoot is not able to be used due to weather or conditions outside of our control before Aug 15, 2011 a refund will be issued.